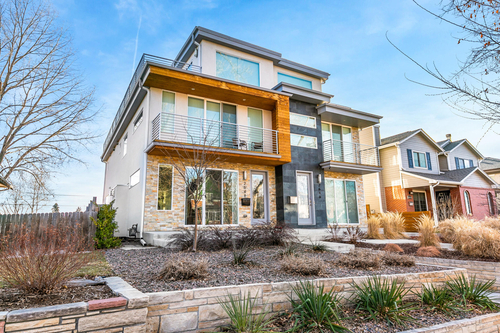 Designed and built in 2014 by Highland Custom Builders, this gorgeous three-story contemporary open concept attached home with finished basement has 4 bedrooms and 5 bathrooms. 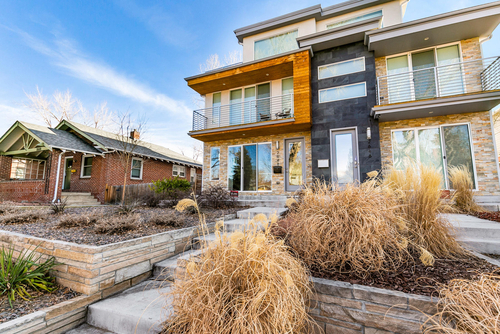 Every detail of this home has been carefully considered from top to bottom offering a lot of living in an eco-friendly footprint. 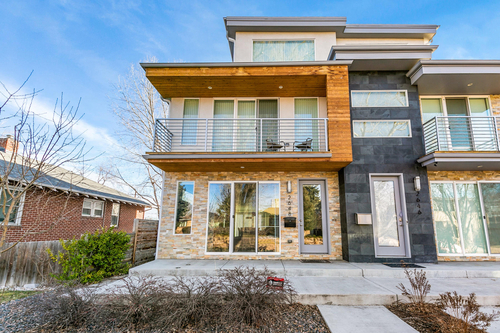 The unique modern exterior finishes includes limestone, slate tile, wood and stucco to create a gorgeous modern style. 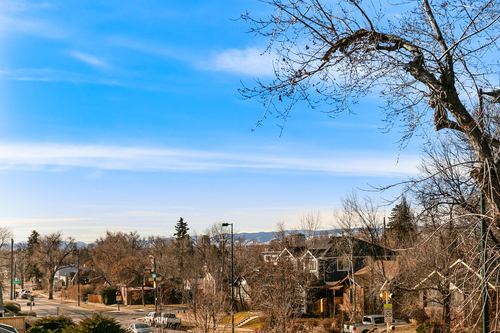 Enjoy mountain views from the second story west facing deck and city views the third story west and east facing wrap around deck. 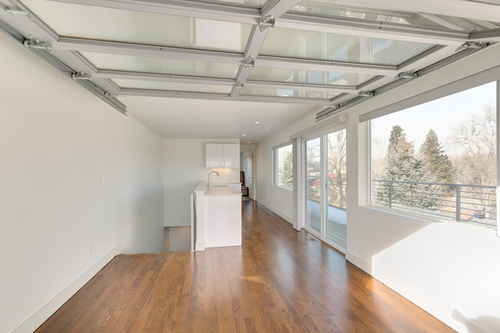 The half-duplex is north facing which offers loads of light. 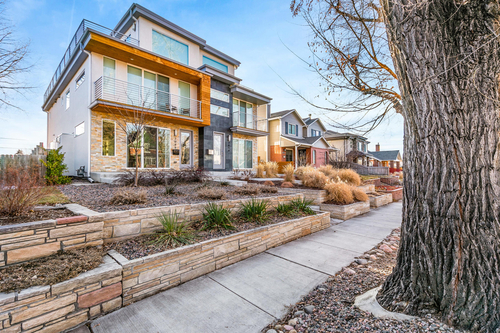 The two-tier terraced front yard is elevated off the street for a sense of privacy while sitting on the front porch. 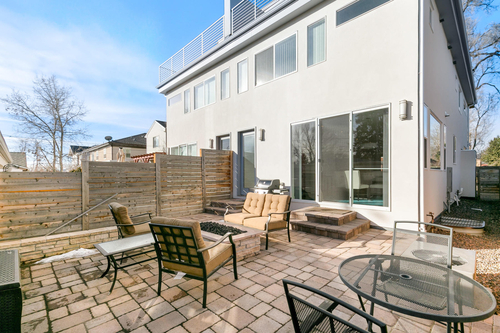 The back yard has a built-in firepit, concrete pavers at steps and back patio and is a the perfect place to relax. . 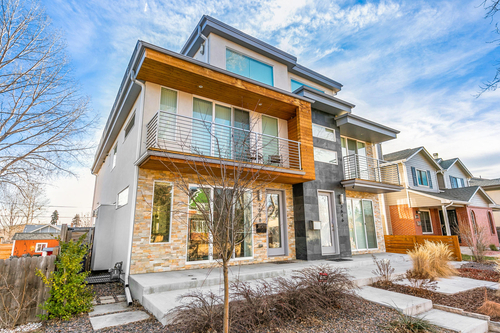 The location is perfect being a few blocks from Highland Square, Sloan’s Lake, and Sheridan shops and restaurant. 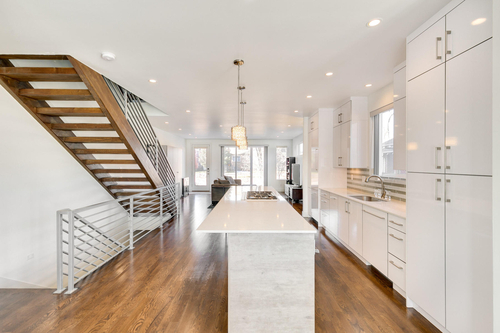 The first floor open concept floor plan with 9-foot high ceilings incorporates living room, kitchen, dining room, mudroom, guest half bath and a floating staircase. The living room is the perfect size for entertaining with 3-1/4-inch white oak wood floors, floor to ceiling stacked quartzite tile surround gas fireplace, custom can lighting, custom paint, coat closet, a clerestory window, single light entry door and features a large sliding glass door opening to the west facing front porch. The beautiful Chef’s kitchen is wonderful for entertaining many people or for cooking an intimate dinner for two. 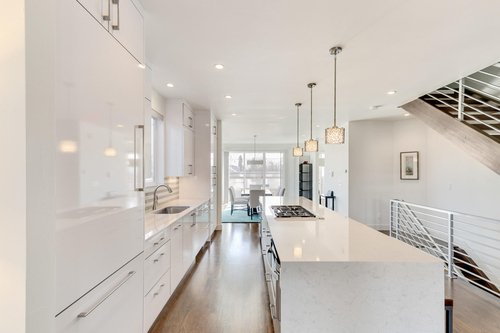 The kitchen boasts Silestone slab countertops, high-end stainless steel appliances, Euro-style soft-close custom cabinets, custom tile backsplash, large cabinet drawers, under-cabinet lighting, 3-1/4-inch white oak wood floors, large basin sink, can and pendant lighting. The Thermador appliance package includes five-burner gas cooktop, electric oven, quiet dishwasher and 82-inch flat panel refrigerator as well as a Sharp drawer-style microwave. 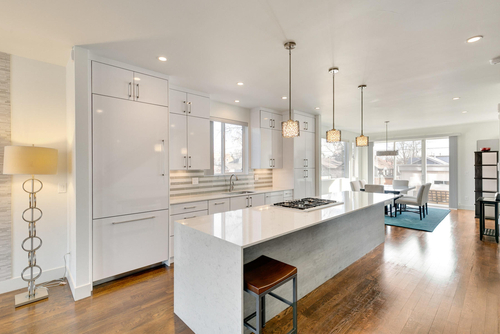 The large Silestone slab island (over 12-feet long) with waterfall finish is lit by three pendant light fixtures and seats six stools. It opens to both the living room and the dining room. A large custom built pantry is an added bonus. 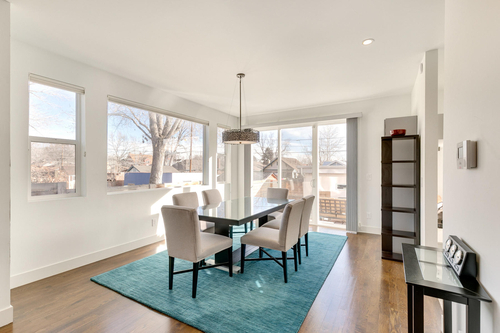 The dining room has 3-1/4-inch white oak wood floors, clerestory windows, custom paint, custom lighting, and features a large sliding glass door opening to the east facing back patio. 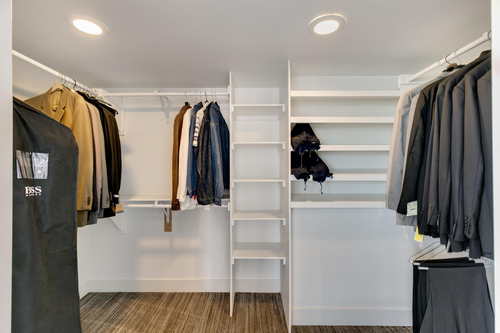 The mudroom features single light entry door from the back patio, tile flooring, large custom storage cabinet, custom built-in bench with coat hooks, storage cubbies and shelves. 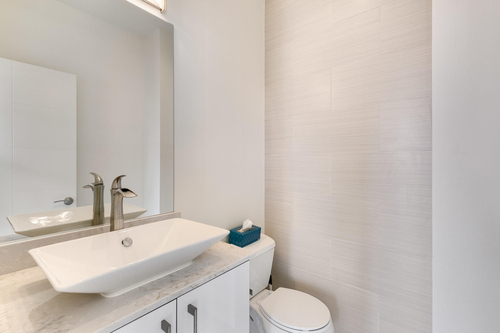 The half bathroom features a modern style tiled wall, tile flooring, Silestone countertop, waterfall faucet and vessel sink. 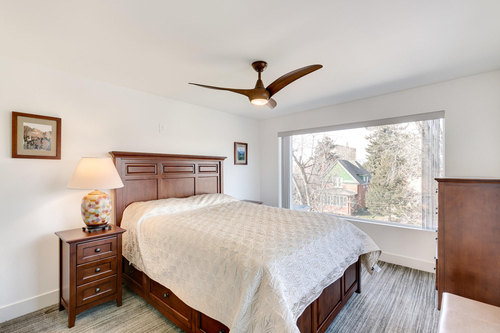 The second floor master bedroom suite with 8-foot 9-inch ceilings is situated on the west side of the house and has a beautiful view of the mountains from the private deck. Other features are Minka Aire wood finish ceiling fan with LED dimmable light, 3-1/4-inch white oak wood floors, clerestory window, large sliding glass door out to the west facing private deck and sliding barn door to master bath. 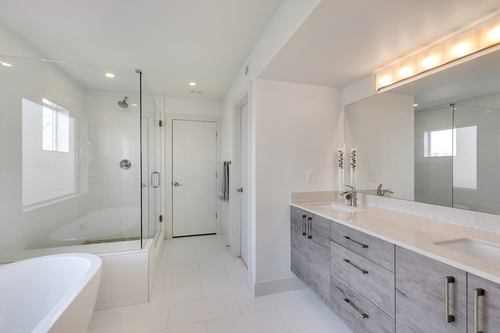 It has its own en-suite five-piece master bath features a double built-in sink vanity with Silestone counter top, large mirror, custom tile, modern free floating stand-alone tub, and walk-in shower with glass shower enclosure. A separate water closet offers privacy and a large walk-in closet for all your storage needs. The second floor second bedroom is located on the east side of the house. 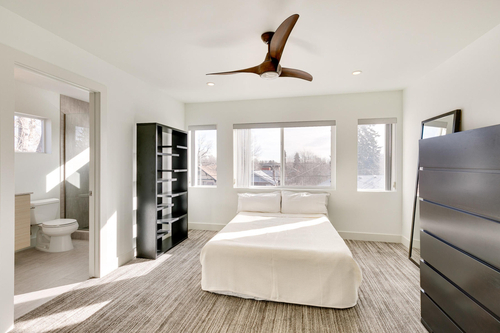 It features Minka Aire wood finish ceiling fan with LED dimmable light, carpet, clerestory windows and walk-in closet. The bathroom has a built-in sink vanity with Silestone countertop, tile flooring, walk-in shower with glass shower enclosure. 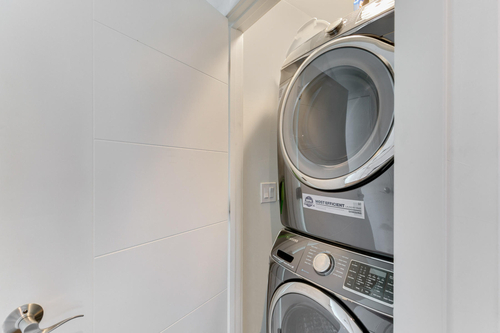 The laundry is conveniently located on the second floor and has a stackable Samsung washer and dryer. 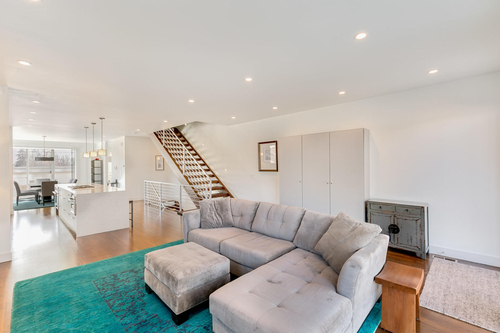 Fantastic third floor recreation room has a wet bar with Silestone countertop, custom cabinetry, wine refrigerator and 3-1/4-inch white oak wood floors. 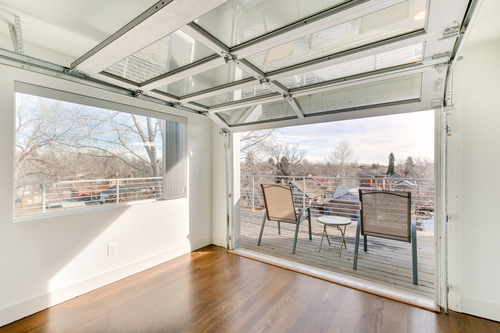 The large sliding glass door and the contemporary glass garage door opens to a 400 square foot wrap around deck that has mountain and city views. The third floor third bedroom is located on the west side of the house. 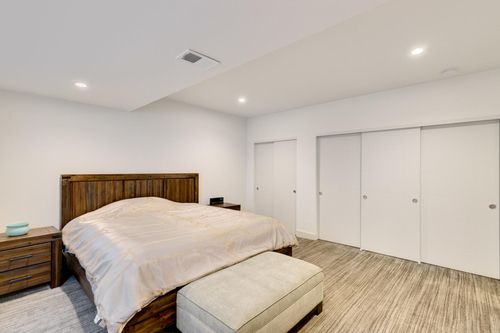 It features Minka Aire wood finish ceiling fan with LED dimmable light, carpet, clerestory windows and closet. 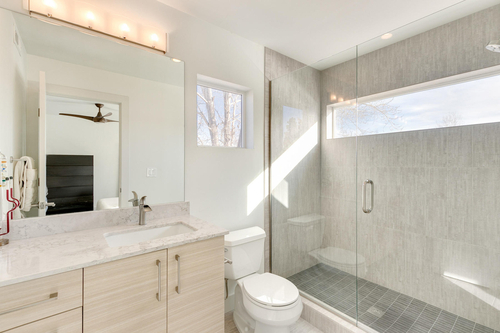 The en-suite three-quarter bathroom has a silestone slab vanity, vessel sink, water fall faucet, tile flooring, walk-in shower with glass shower enclosure. 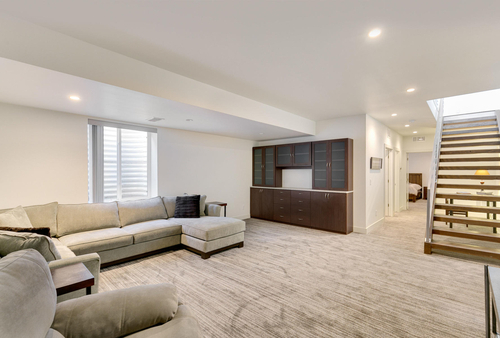 The basement boasts a 8-foot 9-inch high ceiling. 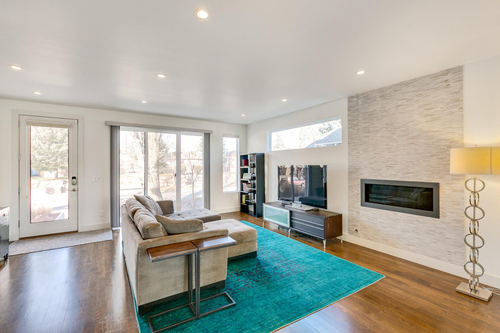 The large, yet cozy family room has carpet, can lighting, egress window and built-in countertop and cabinets. 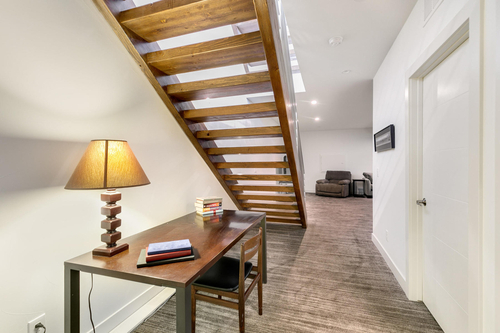 There is a space under the floating staircase which would be great for a desk for work or study. The basement fourth bedroom has a large north facing egress window, custom paint, can lighting fixtures, carpet and a large 15-foot closet. It is located just off the bathroom making it an ideal guest suite. The three-quarter bathroom has a built-in sink vanity with Silestone countertop, tile flooring, walk-in shower with glass shower enclosure. 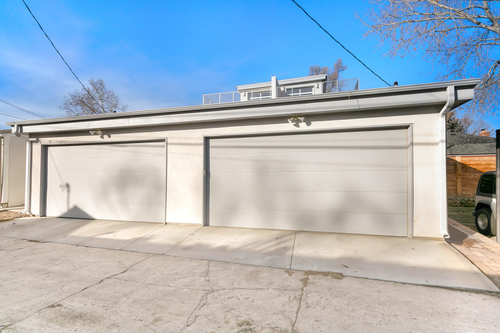 The detached two-car garage with alley access measures 19-feet x 19-feet, has one double garage door, a clerestory window facing the back patio and a 9-foot 6-inch ceiling height. 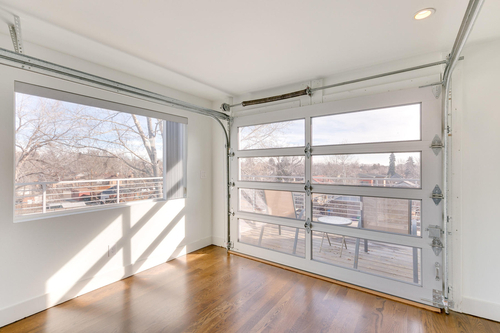 The garage has plenty of room to hold all your gear. The front and back yards are professionally landscaped. 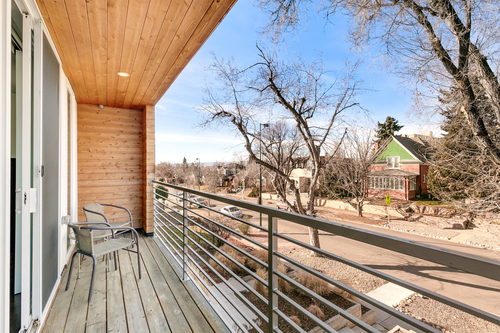 The two-tier terraced front yard is elevated off the street for a sense of privacy while sitting on the front porch. 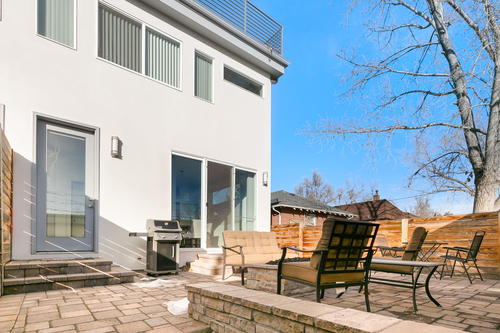 The back yard has a custom built-in firepit with concrete pavers at steps and patio is a the perfect place to relax. The back yard is fenced with gate access to the side of the house. 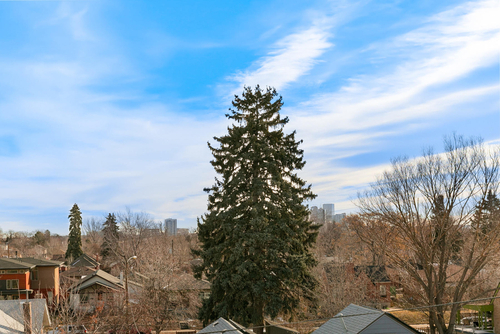 Take advantage of city and mountain views in this contemporary open concept half duplex with high ceilings and large square footage. 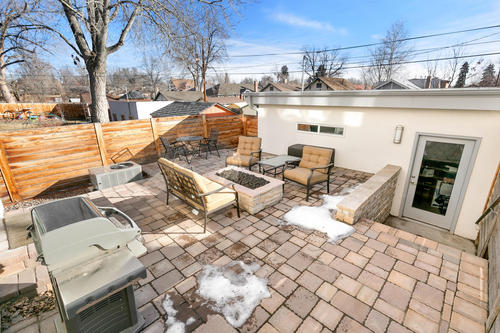 This is a fantastic low maintenance home with quick access to Downtown Denver or I-70 up to the mountains. 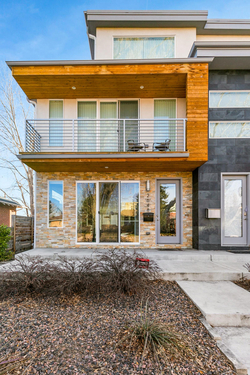 The location is perfect being a few blocks from both Highland Square and Sloan’s Lake. - Floor to ceiling stacked quartzite tile surround gas fireplace. - Horizontal iron stair railing at all staircases. 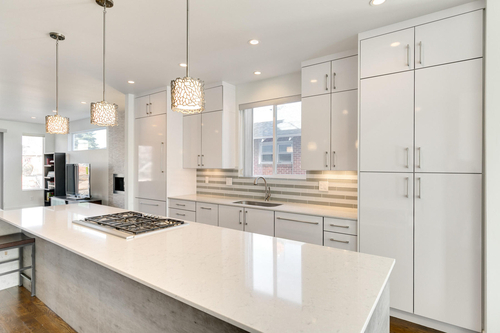 - Countertops in bathrooms, recreation room wet bar and kitchen are Silestone. 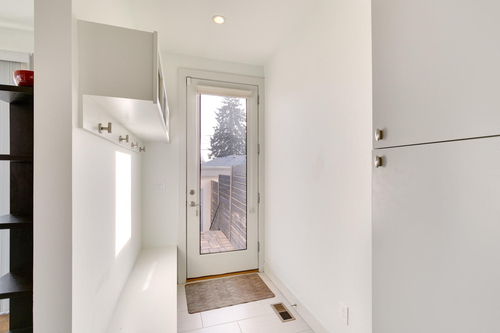 - Mudroom has custom built-in bench with coat hooks, storage cubbies and shelves. - Vessel sinks with waterfall faucet at 3rd floor bathroom and 1st floor powder room. 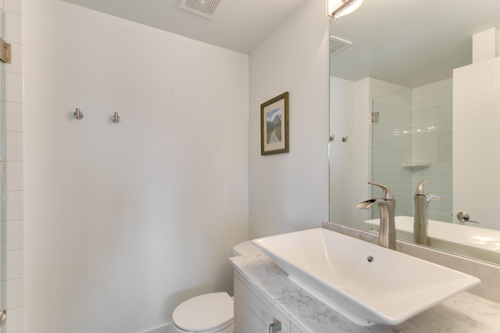 - Built-in sinks in bathrooms on 2nd floor and basement. - Kitchen is large single basin built-in sink. - Large frameless mirrors installed in all bathrooms. - Custom gray laminate cabinetry installed in living room, dining room and mud room. - Custom upper and lower wood cabinets and Formica countertops installed in family room in basement. - Clerestory windows in living room, dining room, master bedroom and second bedroom. - Thermador appliance package includes five-burner gas cooktop, electric oven, quiet dishwasher and 82-inch flat panel refrigerator as well as a Sharp drawer-style microwave oven and Samsung stackable washer and dryer. 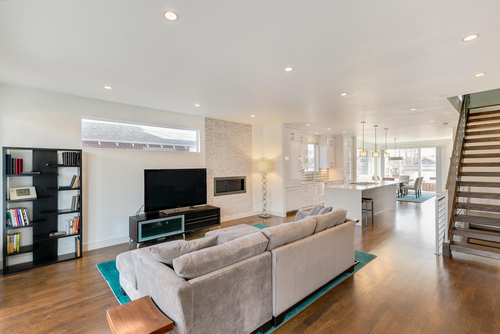 - Ceiling height on 1st floor - 9-foot, 2nd floor - 8-foot 9-inch, 3rd floor – 7-foot 7-inch and basement - 8-foot 9-inch. - Carpet on 2nd bedroom on 2nd floor, 3rd bedroom on 3rd floor and entire Basement. - Minka Aire wood finish ceiling fan with LED dimmable light and remote control in bedrooms at 2nd floor and 3rd floor. - 4-inch modern style can lighting throughout. - Modern vanity lighting in all bathrooms. - LED mini step light with louvered faceplate at stairs. 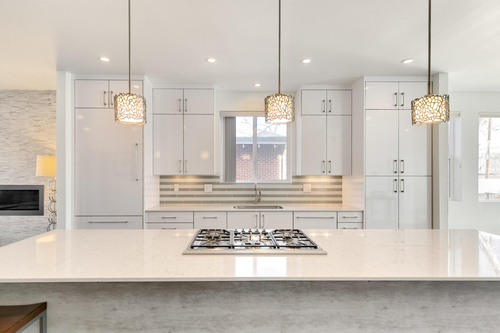 - Kichler pendant lighting at kitchen island. - Kichler light at dining room. - Custom European Built Fina Deco and Zonavita Cabinetry in kitchen, all bathrooms and rooftop wet bar. Style is high gloss laminate with aluminum edge band at kitchen perimeter, rooftop wet bar and first floor powder room. - Zonavita Gray at kitchen island and master bathroom. 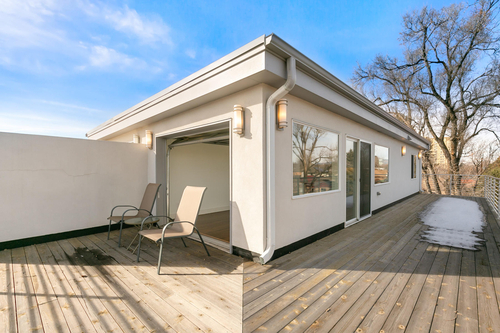 - Fina Summer Breeze in bathrooms on 2nd floor, 3rd floor and Basement. 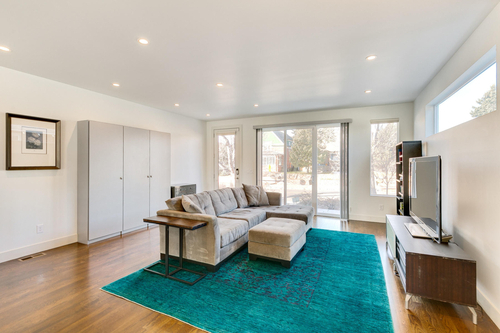 - Modern style Delta plumbing fixtures throughout. 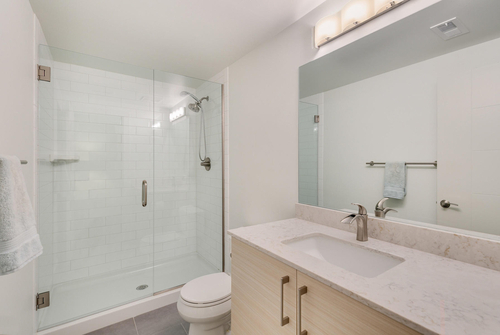 - Showers are custom fitted glass enclosed with glass doors in bathrooms on 2nd floor, 3rd floor and Basement. - Freestanding modern tub in master bathroom. - Front single light entry door has Kwikset KEVO deadbolt with Advanced SmartKey security. Use your smartphone (when in Bluetooth range) or fob or tradition key. - Back single light entry door has tradition key deadbolt. 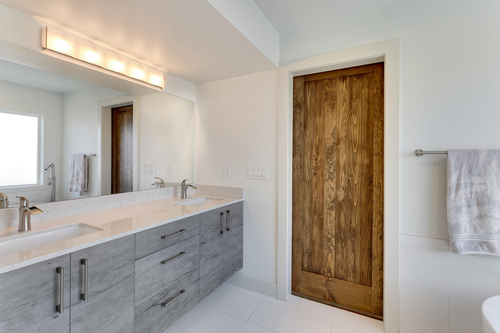 - All interior doors include brushed nickel hardware. - Double garage door with Genie garage door opener. - Large sliding glass doors at front of house in living room, at back of house in dining room, at master bedroom deck and 3rd floor deck. - Limestone finish on lower half of front exterior. - Slate tile from up column ground to 2nd floor. - Wood siding at 2nd floor. - Stucco on 3rd floor front, north side, east side and garage. 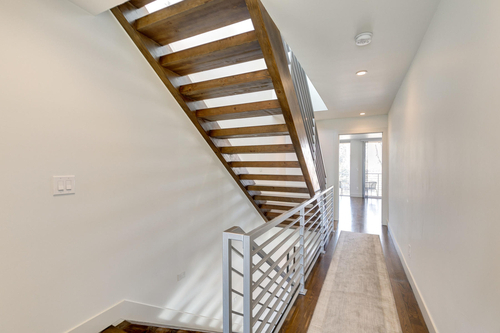 - Horizontal iron stair railing at rooftop deck and master bedroom deck. - Custom steel grate window well covers. - Nest control thermostat for four-zone heating and central air conditioning system. - Hot water heater is 50-gallon size. - Sump pump in basement. - Two-tier stone retaining wall at front of the home with planting areas and irrigation. - Horizonal modern style cedar sealed fence with gates to front and back of house. - Concrete installed at steps to front door and front patio. - Gravel and step stones on the north side of the house. - Sprinkler system for front terraced yard. - Highlands Custom Builders will honor the ten-year structural warranty from the date of original sale, 11/10/2014, in the case of resale. 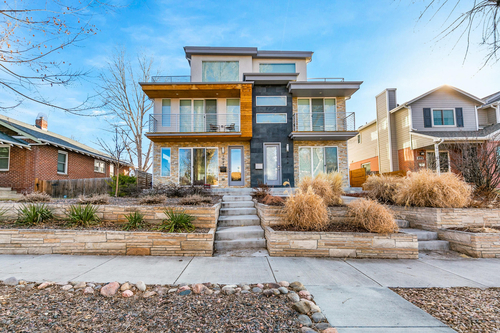 - Highlands Custom Builders is owned by Carl Fuhri @ 303-960-5855.